In the previous blog we looked at the option to use Linked Analysis for visualizations that shared the same model and we were quickly able to use Linked Analysis to provide our users with an interactive user experience to filter the data, without the need to setup a real filter. Now lets take a look at how we can use the table to not only provide a filtering experience, but to also use the table to provide the ability to select a measure based on the selection in the table. For this example we will also use the BestRunJuice_SampleModel and we will create a table as our first visualization. The table shows the product hierarchy in the rows and all measures in the columns. 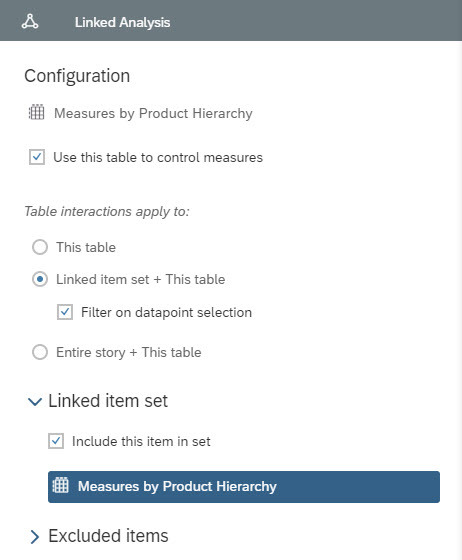 Before we are now adding a chart, we are first going to configure the Linked Analysis for the table because our configuration does have an impact on the next visualization. 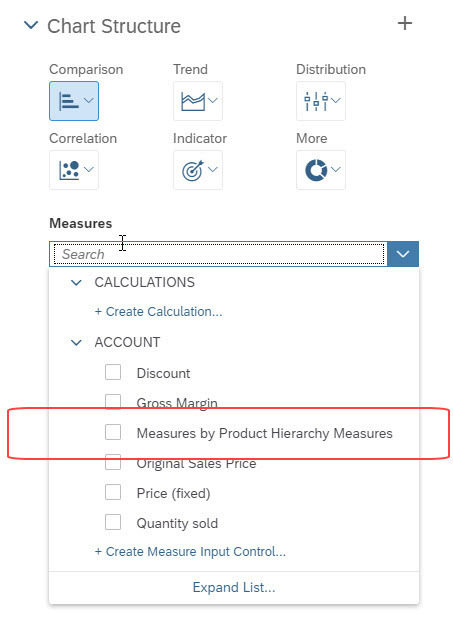 As part of the Linked Analysis configuration, we are activating the option to use the table to control the measures and we are enabling the option Linked Item Set + This table. The option Use this table to control measures allows us for the next visualization to leverage the measure that is being selected in the table (single measure). As next step we going to create a chart. When we open the list of measures for the chart, you will notice that in addition to the available measures from the data source, there is one additional entry based on the Title of the table. For our example we will use this entry, and based on this configuration the user can now select one measures in the table (simply by selecting the column header) and the chart will then be updated accordingly. We are also adding dimension Location to the chart, so that our story with two visualizations should look similar to this. So far we looked at the option to use Linked Analysis between charts based on the same data model, and we looked at the option to use the table to select the measures. In the next blog, we will look into the ability to use Linked Analysis and Linked Dimensions together.